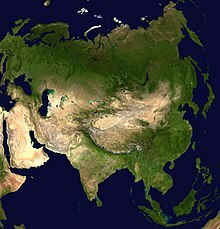 ↑ Russia is a transcontinental country; population and area figures are for Asian portion only. ↑ ၇.၀ ၇.၁ Gaza and West Bank, collectively referred to as the "Occupied Palestinian Territory" by the UN, are territories partially occupied by Israel but under de facto administration of the Palestinian National Authority. ↑ The island of Cyprus is sometimes considered a transcontinental territory: in the Eastern Basin of the Mediterranean Sea south of Turkey, it has historical and socio-political connections with Europe. The Turkish Republic of Northern Cyprus (TRNC), distinct from the de jure Republic of Cyprus in the south (with a predominantly Greek population), is recognized only by Turkey. 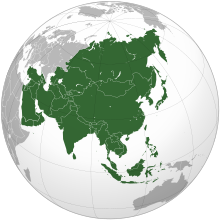 ↑ Turkey is generally considered a transcontinental country in Western Asia and Southern Europe; population and area figures are for Asian portion only, excluding all of Istanbul. ↑ The current state is formally known as the People's Republic of China (PRC), which is subsumed by the eponymous entity and civilization (China). Figures given are for mainland China only, and do not include ဟောင်ကောင်, Macau, and တိုင်ဝမ်. ↑ Figures are for the area under the de facto control of the Republic of China (ROC) government, frequently referred to as ထိုင်ဝမ်. Claimed in whole by the PRC; see political status of Taiwan.